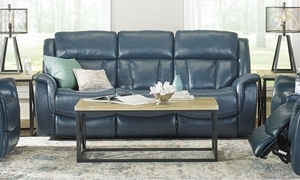 Power reclining sofa features bucket seating tailored in blue top-grain leather, power headrests and built-in USB charging ports. 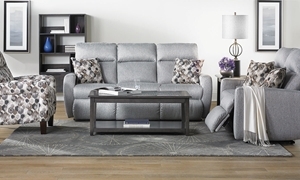 Track arm sofa in soft grey fabric features memory foam seating & power reclining ends equipped with power headrests & USB ports. Handsome 72-inch sofa featuring welted track arms and tight back converts to a full size sleeper with an air coil innerspring mattress. 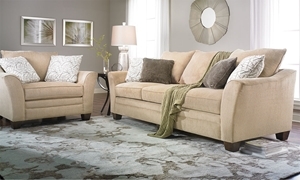 Casual chic sofa with tapered flare arms provides a plush place to sit with sumptuous back cushions and four soft toss pillows. American-made Lawson-style sofa with durable hardwood frame easily transforms into a queen size sleeper for night. American-made sofa with welted track arms and dark round feet converts into a queen size sleeper with gel memory foam mattress. Power reclining sofa with top-grain leather seating and plush back features full-leg chaise design, power headrests and USB charging. Lawson-style sofa features paneled roll arms accented with pewter nail heads, welted cushions and tapered legs for a timeless look. Sofa showcases a pleasing blend of contemporary and traditional styles with sloped track arms and a diamond tufted back. 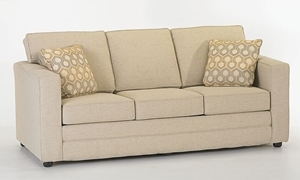 American made sofa exemplifies casual charm with its chic flare arm silhouette upholstered in a versatile neutral fabric. 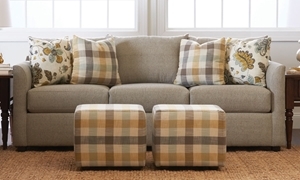 Plush accent pillows and cream upholstery with a soft wool feel give this sophisticated sofa a warm and cozy touch. 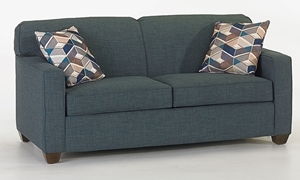 Welted sock arms and cushions in muted blue upholstery atop tapered dark wood legs give this Lawson style sofa a crisp new look. 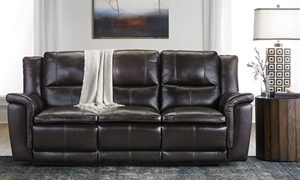 Haynes Furniture has a vast assortment of sofas for every style and budget, from modern and retro sofas to traditional English sofas tailored in top-grain leather with hand applied nail head trim. 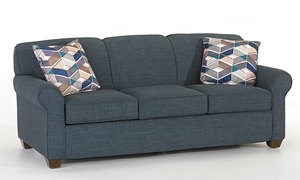 Whether you're looking for a sophisticated handmade sofa with goose down cushioning or just a comfy new couch for the family to curl up in, come see us. We have the exact style you’ll love.